Summary: Miami-Dade County Parks, Recreation and Open Spaces Department's Sea Turtle Awareness Program will implement the proposed Sea Turtle Youth Awareness Project aimed at providing sea turtle awareness education to 1,350 at-risk youth from various underserved areas within Miami-Dade County. The sea turtle education project will promote the understanding of the biology, health, life history, and habitat needs of Florida's marine turtles and the protection and conservation of these species among our community's youth via multi-media presentations and innovative hands-on activities. 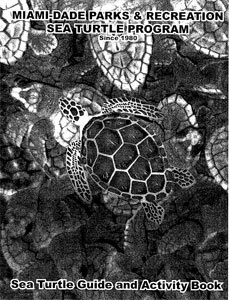 Requested funds will be used to facilitate sea turtle awareness education programs to 1,350 students at-risk youth from various underserved areas within Miami-Dade County. Results: 1400 students in 43 Title I schools were taught by our educators. The educators used a 45 minute power point presentation, a variety of hands-on materials" including shells, skulls, preserved specimens, nest displays and various laminated posters. The naturalists commented that many of the children were shocked to learn that their own coastline played such a large role in the ecology of sea turtles; though they had seen documentaries they did not realize it was taking place in their own backyard. Many children expressed a new appreciation of the ecology of sea turtles. It is our expectation that these classes will nurture the children's desire to be active students of their natural areas.